The journey from darkness to light need not be a difficult and lonely one - especially with a little support along the way. Themed "Out of Darkness - Into the Light", the inaugural Art Competition & Exhibition organised by SOS aims to encourage participants to express their interpretation of HOPE through colours and various art forms - an excellent platform to display your creativity and talents whilst instilling hope in those feeling helpless and hopeless. ‍Suicide remains a taboo in Singapore. Yet, not talking about it only adds to the distress of those at risk as they feel trapped by the stigma. It is time we build a community that will reduce the stigma of suicide by offering hope and referring people to help. Suicide is preventable. Everyone has a role to play in preventing it. Top entries will have their work showcased at the exhibition open to the public. 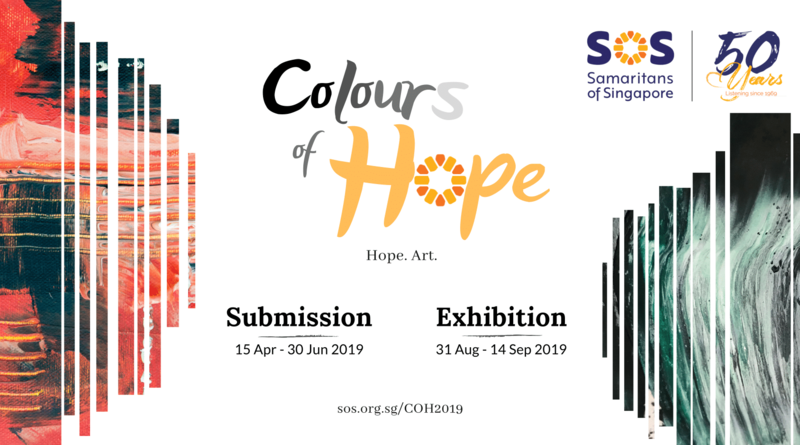 The exhibition will include an exclusive gala opening event that will include distinguished guests from the diplomatic, religious and arts communities in Singapore. *19 years and above. The open category consists of Non-Professional and Professional artists. Participants may submit as many pieces as you like. However, each participant is entitled to one prize per category only. There will be 3 top prizes for each category. Special Mention prizes will also be awarded to artists with outstanding art pieces. There will also be a “Facebook Most Likes” and “Instagram Most Likes” prizes. When can I submit my artwork? ‍We are accepting entries from April to June 2019, and the judges will make their decisions after that. Top entries will be displayed at our exhibition in August! ‍- We accept participants from all countries. Artworks need to be sent to Singapore. - Please register with your complete particulars. - You will receive an acknowledgement by email within 24 hours. - Please print out the registration acknowledgement that you receive and submit it together with your artwork. Entries without the printed registration acknowledgement will not be accepted. - Entry for the competition is free of charge. ‍Note: By registering, you agree to abide by the Terms &Conditions of this competition. ‍- All International and Singaporean Participants. - All entries have to be submitted with a printed registration acknowledgement by 30 June 2019 (Singapore). We strongly encourage sending by registered mail. See here for full Terms & Conditions.